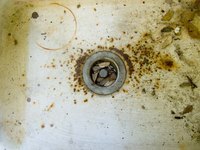 A kitchen or bathroom sink is an ideal playground for foul-smelling bacteria. Food particles and other waste can become trapped in the sink drain and cause the room or even the home to be filled with an undesirable odor.To avoid the embarrassment and discomfort of a smelly sink, a regular sink cleaning regimen is helpful. The solution to this problem can be found in the kitchen pantry. Remove all food particles, hair, and other debris from the sink and sink drain. A simple mixture of soap and water may be used for this step. A dirty sink can contribute to foul sink odors, so clean thoroughly. Run hot water down each dirty sink drain for three to five minutes. The hot water will release grease clots and kill germs if the temperature is hot enough. While the water is running, slice a whole lemon and squeeze the juice down the drain. Place 1/2 cup of baking soda and 1/4 cup of salt in the sink near the drain. Allow the mixture to sit in the sink for three to five minutes to allow the baking soda time to neutralize the sink odor. Place 1/2 cup of vinegar in a microwave-safe container and heat it in a microwave until warm. Pour the heated vinegar down the drain. The combination of vinegar and baking soda should start to fizz and bubble. Allow the mixture to activate inside the sink drain for 15 minutes. Rinse the vinegar and baking soda mixture down the drain with more hot water. Allow the hot water to run for three to five minutes. If desired, squeeze the remaining half of the lemon down the sink. The dirty sink should now be clean and the stinky sink odor should be gone. If the water from the faucet is not hot enough, try boiling the water in the microwave or on the stove top. Always use care when using commercial household cleaners to clean the sink. Make sure the room is properly ventilated. Be careful when using boiling water in order to avoid injury.